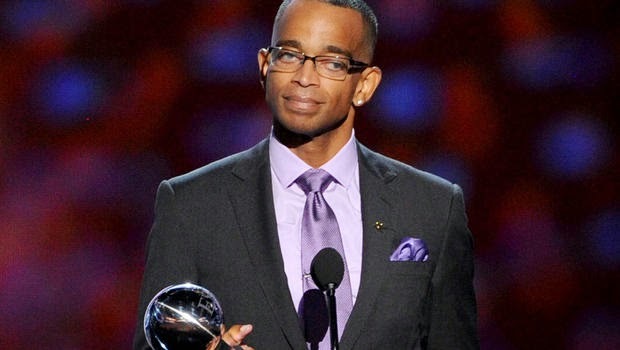 An undated photo of ESPN sportscaster/host Stuart Scott who succumbed to cancer earlier today at the age of 49. It was just before 11am this morning when I saw the news about the passing of longtime ESPN sportscaster/host Stuart Scott when it popped up in my Facebook newsfeed via a friend's status update. I knew that he had been ill of late but denials of unfounded rumors of hospice care in early December were the last time I noticed any news about his condition. Although he put up a very brave 7-year fight, Scott succumbed to appendicial cancer, an extremely rare variety of this disease that affects about 1 in 9 million Americans and also was a factor in the death of legendary actress Katherine Hepburn back in 1993. At first, I wasn't sure if I was going to honor his passing here with a "memoriam" post. The other two individuals to which I have extended this type of commemoration included World War II-era reporter and television personality Andy Rooney and Helen Thomas, the groundbreaking White House correspondent--both passing away in their tenth decades of life and were active until the end. Each made their mark in a medium that many believe is becoming more irrelevant in an environment that Scott's television home, ESPN, and others helped to transform over the past 30 years. It was only after I reviewed his biography that I noticed his connections to journalism and saw that he did "pay his dues" prior to taking his talents to a worldwide audience. 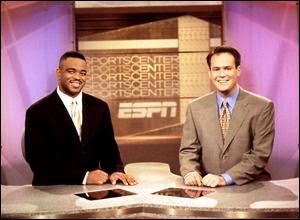 An undated screen grab showing Stuart Scott (left) and Rich Eisen (right) on the ESPN SportsCenter set. According to his Wikipedia biography, Stuart Orlando Scott graduated from the University of North Carolina in 1987, earning a Bachelors of Art in Speech Communication and worked at the school's radio station as an undergraduate. After college, he worked as a news reporter and a weekend sports anchor for a South Carolina television station and it was in that latter role that he began to experiment with his now-famous non-traditional catchphrases when describing sports-related subjects ("cooler than the other side of the pillow" and "Booyah!" being the most notable). 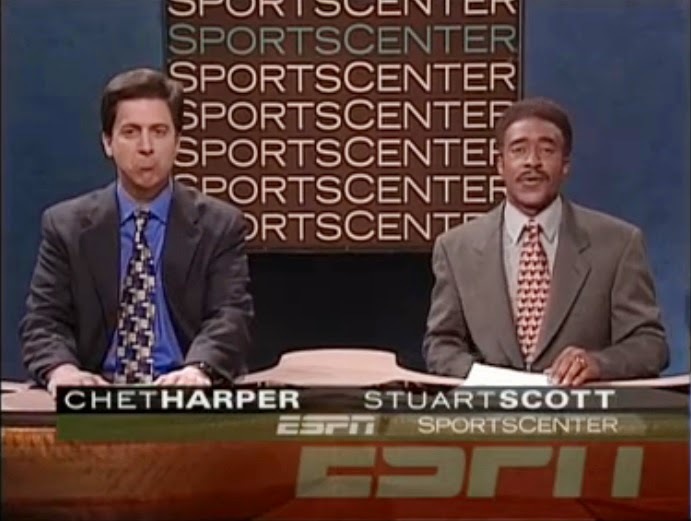 Scott made his national debut with the SportsNight show on the then "youth-oriented" and "informal" ESPN2 network in late 1993 and his on-air style complemented the attitude and "swagger" network executives wanted for capturing that particular audience demographic. 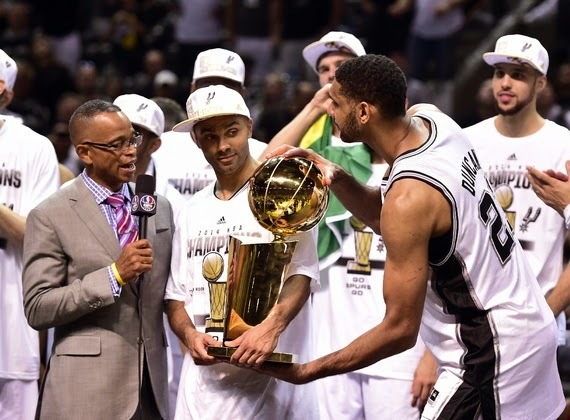 Over the next 21 years, Scott would become one of ESPN's most familiar faces to viewers with his inclusion for the network's coverage teams of both the National Basketball Association and the National Football League as well as reality and game show offerings. He also appeared in several movies and television shows as either himself or in a sports announcer-related role based upon the personality he exuded during his regular stints with long-time co-host Rich Eisen and others he was paired with after Eisen's departure for the NFL Network in 2003. He was given what could be the ultimate professional honor when his on-air persona was parodied by Tim Meadows during a March 1999 episode of NBC's Saturday Night Live. News of Scott's death quickly spread via social media and accolades started pouring in from athletes, coworkers and even the White House to comment on his passing. The primary network immediately modified their television and radio programming to provide continuous coverage of their host's passing. Many of his colleagues were caught completely by surprise and had a hard time keeping their composure on the air. Before modernization in the late 1990s to satellite and digital technologies, the Armed Forces Radio and Television Service was not the most expeditious provider of live news and sports. 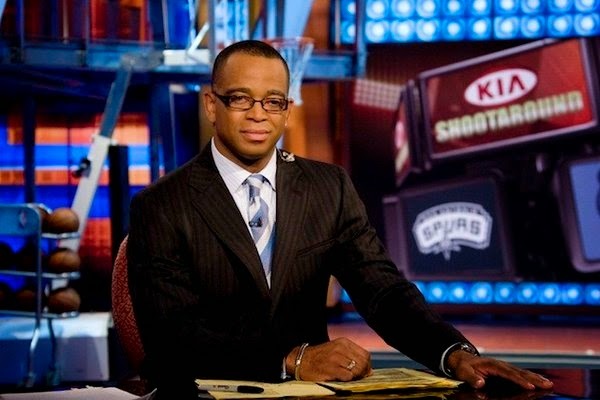 Like any other ESPN and ABC Sports viewer, I knew who Stuart Scott was but other than his pop culture idioms and metaphors, he didn't attract any undue attention from me but that could also be said for any sports-related programming since 1980. I cashed in my "fanatic" card when I endured five straight years living outside the United States and only having the often-delayed Stars and Stripes and the tape-delayed Armed Forces Radio and Television Service, or AFRTS, to get my sports fix. Nick Charles and Fred Hickman provided daily updates via CNN Sports Tonight telecasts and The George Michaels Sports Machine was a once-a-week nationally syndicated treat to supplement those cable news offerings. I normally don't get very excited about a sport until their playoffs start so regular season activities are noted primarily for "water cooler" value. I missed two Super Bowl telecasts in the 1990s due to military related travel and my early morning work start times preclude many prime-time bowl game or championship views. 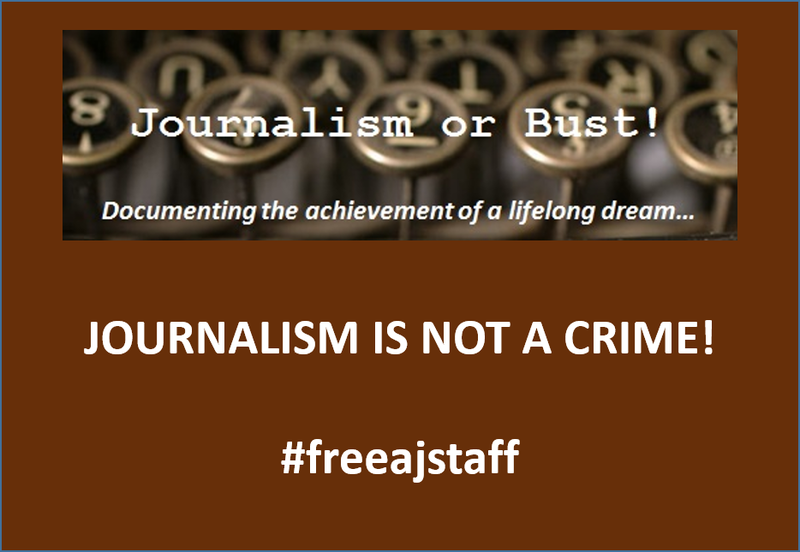 Although it might not be the most appropriate venue, I do harbor resentment about the transition of journalistic and media assets away from their more traditional roles and "beats" to focus reporting on the activities within the worlds of sports and entertainment. The precipitous growth of these "infotainment" sectors, in my opinion, demonstrates the erosion of the core tenets of "the Fourth Estate"--those of oversight of and informing the public about the activities occurring within a democracy. Countless hours of television and radio time are spent informing viewers and listeners about the minute details of a game or a team or a movie but we somehow can't get beyond the "debate dungeon" and "equal time" techniques regularly seen on cable news outlets or on the op/ed pages of most American newspapers. 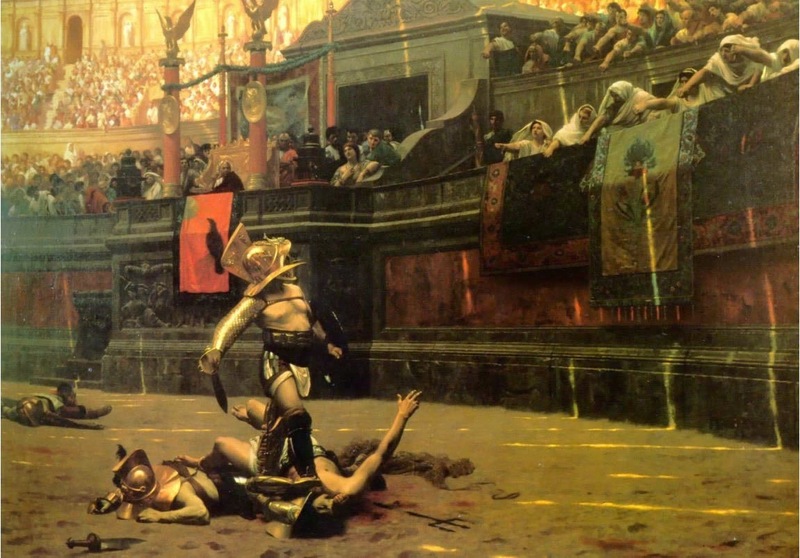 The Roman rulers provided "distractions" (in the form of bribes and public spectacles like the combat scene above) to gain and keep control within the empire. At one time, sports and entertainment were pleasant diversions to the mundane but vital realities of our lives but they somehow have become the primary focal point for a growing majority of people in our current society (and this is not just an American phenomenon). In Roman times, the phrase panem et circenses (more familiarly translated as "bread and circuses") was coined to describe the methods the ruling class used to distract the commoners from their birthright of political involvement within that society for their own gain through the use of bribes and/or distractions. This placation has direct parallels in modern times with the explosion of devices and outlets meant for "relaxation" or "refreshment" from the stresses and rigors of the human condition. Hundreds of television and radio channels, portable music, and social media feeds continuously accessible via wireless technologies can overwhelm individuals who are unaware of their life-numbing dangers (or perhaps they simply choose to quit paying attention anymore). More people today are probably more familiar with the terms "LOL" or "Booyah!" 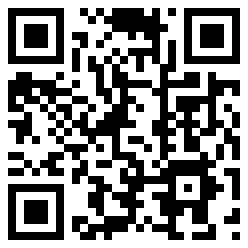 than they are with the concepts of legislation or budgeting or simple economics. Support for a sporting team mimics--and sometimes exceeds--the level of fealty a citizen should have for their community or their nation. The permeation of corporate sponsorship, monies and influences into sports, entertainment, our news industry as well as our politics provides any astute observer a definite "tell" into their ultimate goal through their methods and motives. People like Scott and others at ESPN and in the other sectors mentioned above do perform a service but, unfortunately, that work is not for the audience we believe it to be nor for the benefit of society as a whole. A Review of My "Year of Application"